Four Important Rules to Safely Use Cloud Storage as Cloud Backup - Ask Leo! 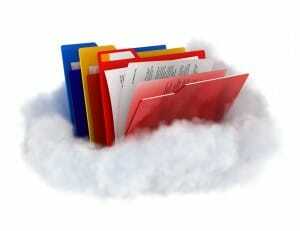 Cloud service providers often give us lots of storage that we can use for cloud backup. How to use it safely, however, isn't always obvious. I now have 1 TB of Microsoft OneDrive storage. How should that affect my backup strategy? Most of my data files are now on OneDrive; do those need to be backed up? Can I use OneDrive space as my “external hard drive” for backups of my other files? How about for image backups? Can/Should Macrium Reflect put a system image onto OneDrive? Other advice re wise and safe use of cloud storage? The availability of lots of cloud storage services has greatly expanded our options for keeping our data both safe and accessible. While it’s expanded our ability to establish cloud backup options, it’s also greatly expanded our ability to get it wrong. It’s now very easy to think you are backed up when you are not, or to inadvertently expose yourself to additional risks. Let’s review some rules about backing up, and about cloud backup specifically. If there is only one copy, it’s not backed up. I don’t care where you keep your data – on your computer, in the cloud or somewhere else – if you have only one copy then, by definition, your data is not backed up. So when you say, “Most of my data files are now on OneDrive; do those need to be backed up?” the answer is a resounding YES. Just because the files are stored in the cloud doesn’t mean that you won’t lose them; you may just lose them for different reasons. Yes, the service provider is most likely backing up its servers, but that does you no good whatsoever if you accidentally delete a file – or worse, your online account gets hacked and the hacker deletes everything. You must back up the data you keep in any online service, or you are at risk of losing all of it in an instant, forever. The answer to “Can I use OneDrive space as my ‘external hard drive’ for backups of my other files?” is a qualified “yes”. Cloud services are, in fact, great places to back up many files on your computer. 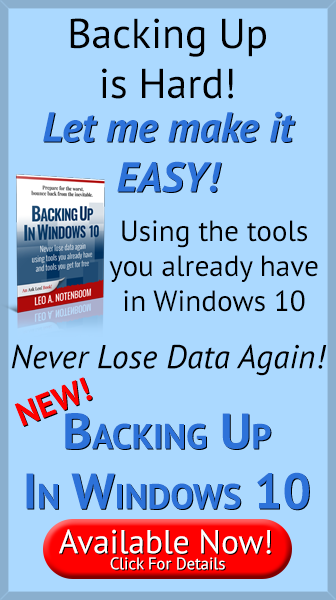 In one operation, you get both backups (an additional copy of your data) and off-site backups (copies stored somewhere other than where your computer is located). That’s actually a very good use of cloud storage as cloud backup. As several celebrities discovered not that long ago, if your online account is compromised, it’s possible that your files might become accessible to hackers or others. As I’ll discuss in a moment, that means the security of your online account is critical. It also means you may want to think twice about what files you place in the cloud. Or, you might want to consider how you place them there. One alternative that works well is to make sure that the files you place in the cloud are encrypted before they’re put there. You can do that yourself, manually, or consider using a tool like BoxCryptor to encrypt your cloud backup automatically. Unless you have an amazingly fast internet connection, the cloud is not a viable solution for image backups of your computer. And yet, having complete image backups of your computer is key to being able to recover quickly from a variety of disasters. You need to keep doing them. Why aren’t cloud backups ready for image backups? It’s simply an issue of size and time. Image backups are large – multiple, if not hundreds, of gigabytes. Even on a fast internet connection, that could mean days or weeks to upload the backup to online storage. Often image backups are created and updated faster than they can be uploaded to a cloud service. So while cloud backup using cloud storage can be a very convenient and helpful addition to an overall backup strategy, it’s in no way a replacement for local backups, nor is it an appropriate place to put your image backups. The security of any online account is important, but for the account you use for cloud backup it becomes even more important. It’s too easy not to take your online account security seriously. You get the idea. It’s basic internet security that we should all be doing anyway, but it’s easy to overlook and easy to get wrong. And when it comes to those important accounts, like an account you use for cloud backup, then additional measures – like perhaps two-factor authentication – might also be called for. Cryptomator: Encryption for Your Cloud Storage - Cryptomator is a powerful tool to protect the data you place into cloud storage. An Abundance of Cloud Storage - It seems like every online service provider is now including some kind of online cloud storage as a perk. It's easy to feel overwhelmed. I'll look at my personal cloud storage landscape. With the horrible upload speeds in the U.S. how about the new personal, network “clouds” such as “WDMyCloud”s? This may sound like a dumb question but, they are accessible over the internet so hacking is still possible. At least they save at your network wifi speed. In the case of this user with 1TB of cloud storage and lets say backing up this data results in a compressed file of 500GB how does the cloud provider actually back this up ? And add to this the possibility that maybe 10,000,000 customers have signed up and are using this service with 1TB each ! I don’t see how this is done economically or even at all. I do not recommend the cloud to any of my customers because of the possiblity of total loss of the service and contents, permanently or temporarily for long periods. I would think that the cloud providers backup consists of raid 5 arrays with as many disks as possible in the array. And that is not a backup. And if you need some data back quickly how long does it take to work your way through the cloud company layers to get the restore done. And what happens if both your company AND the cloud company are in the same State and both get clobbered by some major catastrophy. I can see how it might actually take weeks (if ever) to get access to your data when there might be another 1,000,000 customers all trying urgently to do the same thing. So maybe the cloud provider has a duplicate site on the other side of the country (would love to see the link between them) so that means TWO huge sites AND TWO backup systems. With mans ability to oversell anything and everything I cannot see the cloud being a viable system at least for the forseeable future. In Christchurch during the large quake a few years ago a lot of people lost access to their computers when their buildings and offices were were made offlimits, or even condemned on the spot, because of potential danger. A simple 1TB disk bought in from home could have provided full access immediately rather than the long wait for a cloud supplier to get organised. In this instant the only holdup would be the provision of sufficient hardware to rebuild and that is and was also a major concern. The whole area of major disaster recovery (including company data) is not well thought out at all. You only had to watch Japans efforts during their major tsunami and the US’s handling of the New Orleans floods to realise that man just cannot cope with major disasters without such a level of planning that we are incapable of yet. My understanding is that most online services – from email to storage to photo sharing to whatever – typically backup to high capacity tape. They DO back up. The unknowns are how often, and hwo many copies do they keep and for how long. Using tapes isn’t going to help much. It certainly doesn’t inspire me with confidence in using the cloud as backup storage. Using my figure of 10,000,000 potential users (and I do understand that this may not be a “real” figure) each storing 1TB or 500GB compressed (and hoping that the data isn’t already compressed like jpgs) this means that you can fit 3 users onto a single LTO-5 tape (3TB capacity with compression) and a maximum transfer rate of 504GB/hr so it takes 3 hours to write one tape for 3 users. That mean 10,000,000 users will take 10,000,000 hours to backup. Allow 1,000 tape machines that still means 10,000 hours to do one full backup. That’s 416 days for 1 backup. So how often do they do this and how many copies do they make ? And how long would it take to restore 1,000,000 users from tape ? Of course this assumes a lot of things and I am guessing that we are in the early days of cloud storage but I still wouldn’t rely on using the cloud to back up anything critical. Until high speed internet happens (bandwidths of terabits/hr into every business and home) AND the next couple of generations of high capacity storage media is in USE (rather than just being talked about) then the cloud is not a viable medium for medium to large business’s – other than maybe the first few to get into it early. If you, as a provider company of cloud storage, have say 10-20 clients all using the cloud then maybe the it might work for a while and be manageable but using my figure of 10,000,000 that makes 500,000 new cloud storage companies (less the few that now exist) required. So if you are using cloud storage as backup I would suggest you ask the companies just how they would cope with a major emergency, how often they backup, where the backups are stored, how long to restore if say 1/2 of their users need it doing at once, and any number of other questions. Other than a few specific cases where it may be a viable alternative (niche market) I contend that cloud storage, especially for backup purposes, is mostly hype. I have not done the extensive numerical analysis that CC presented abov, and it is sobering. However, at least in my case, the Cloud Backup (actually it is DropBox) is multi-purpose, and does the job. I maintain 5 computers at home, three are for my primary use, one general and one for my wife. Putting all of my data on a DropBox folder gives me some benefits (1) the assumed Cloud Backup, (2) my data available on any of my computers, even a public computer, and (3) I can back up my wife’s data at the same time that I back up my data onto an external drive. In the past I found it more convenient and faster to recover an inadvertently deleted folder from my DropBox account than using Macrium Reflect to restore it from the external drive. That may be different if we are talking about many Gigabytes. My primary backup is still the external drive, but DropBox offers the obvious benefits. As to global disaster, well, when that happens, I would have bigger things to worry about. I realise this is coming late to this discussion, but I use Google Docs quite heavily, and a sync client for Google Drive by a company named Insync. It seems to address most of the issues with Google Drive, not least that it syncs the full files to your local machine, converting them to either MS Office or Open Office format as it does so. I have used it for a while and found it both robust and consistent. In addition my local data is all backed up using Crashplan, although there are other cloud backup services that do equally well. So I have a local copy in MSO format, a Google Drive copy on Google’s servers, and a backup copy on Crashplan’s Australian servers. It all seems to work reliably and has saved my bacon a couple of times. I am not sure whether it is acceptable or not to mention commercial products and services by name, but I have no connection whatsoever with either Insync or Crashplan other than as a very satisfied customer paying their full asking price for what they offer. If this comment can be published perhaps it might encourage a few of your readers to consider a similar setup.